Janice Small says she was sent "kicking and screaming" to Options Recovery Services. Two dozen people sit around long tables, slim needles protruding from their ears and foreheads; some close their eyes, others stare into the distance. They don't talk. The only sounds are the soft music vibrating through the large room and the hushed voice of acupuncturist Jane Weinapple, explaining how the acupuncture treatment will help alleviate stress and blunt the craving for drugs. It's Jay's first visit to the Options Recovery Services acupuncture program. "The better your energy circulates, the better you will feel," Weinapple tells Jay, showing him a diagram of the ear and indicating where she'll place the needles and the effects they'll have. Options clients and the substance abusers that Weinapple treats come to acupuncture as part of their recovery from drug or alcohol addiction. And although it's relatively unknown, the treatment of substance abuse with acupuncture has been a stable practice in Berkeley for the past decade. However, growth of the program may be blocked by recent budget cuts. Jay scarcely feels the pin prick as Weinapple inserts the needles. He asks if acupuncture can help with the pain in his shoulder and knee. It can; and Weinapple inserts additional needles. "This is the only [Options] class where you're allowed to fall asleep," Weinapple says with a smile, offering Jay a cup of herbal tea and directing him to join the others sitting around the tables. She then turns to the half-dozen clients who had formed a line behind Jay, some waiting to have needles removed, some to have them inserted. Before each person leaves, Weinapple offers to tape a vaccaria seed into their ears. The seed itself has healing properties, Weinapple says, and "when they press on the seed, the seed puts pressure on the spirit gate [acupuncture] point, so they're doing acupressure on themselves." Visits to this acupuncture clinic are part of a rigorous outpatient regime that includes three hours of group and individual sessions five days each week. Weinapple also treats substance abusers at the LifeLong Medical Care Clinic in Berkeley with Hope McDonnell, who had run the acupuncture program at the Suitcase Clinic before the city recently cut its funding. Clients at the Suitcase and LifeLong clinics take part in less-regimented programs that they design themselves, and that may include acupuncture, counseling, and Alcoholics Anonymous or Narcotics Anonymous meetings. People come to Options by literally walking through the door and asking for help. Or the courts may refer them: Under California's Proposition 36, a judge can offer certain offenders with drug-related charges an opportunity to go through a treatment program rather than serving jail time. 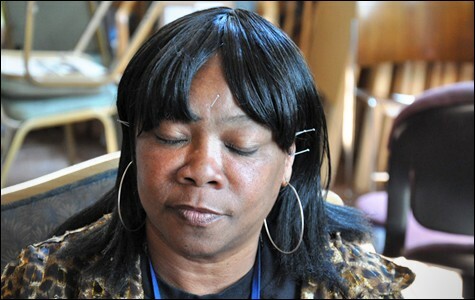 Some participants come to Options straight from jail or prison. Nine years ago a judge sent Janice Small to Options "kicking and screaming," she said, "saying that I didn't need any help." Small is now a counselor with Options. Acupuncture has been an important part of her recovery — a process that lasts a lifetime. 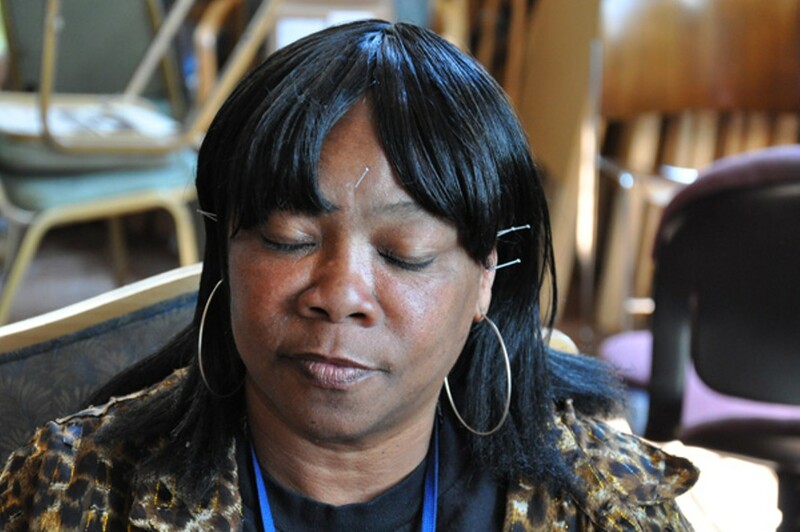 At first, acupuncture helped her deal with stress and smoking cessation. These days, she's found acupuncture especially useful in helping her focus on her classes, as she's studying for a more advanced certification in counseling. The seed that Weinapple taped to her ear was a particular help in the earlier stages of recovery. "I was fighting, trying to stay sober and stay clean. I used to rub that little seed every time I felt the urge coming up — the cravings," she said. Everyone who is ready to give up drugs and alcohol is admitted into the Options program, which often starts with a trip to a detox facility, said Dr. Davida Coady, Options founder, medical director, and recovering alcoholic. Counseling, access to clean and sober housing, and help getting government assistance is part of the program. Every Options client is required to go to the acupuncture clinic. Those who resist the treatment must observe some sessions. "They can sit and listen to the music and Jane will talk to them," Coady said. "It's a rare, rare person — maybe three or four — that doesn't decide to try it." The program started fifteen years ago. Weinapple said that for many clients, acupuncture is about learning to trust. "So many people who come here have been so disenfranchised by the whole medical system, they don't trust," she said. "They come here and they learn a whole different aspect of caring for themselves and of people helping to care for them." Kim Chavez, another counselor at Options and a recovering drug addict, is among those who initially balked at participating. "I thought it would hurt," Chavez said. "But once she put the needles in, it didn't hurt at all. I kept coming back and getting them and I realized it was beginning to help with detoxing off drugs and it helped me with drug dreams. When I stopped having acupuncture, the dreams came back." Dreams of taking drugs are a frequent reaction to detox. "Your body's receptor sites in the brain are saying, 'Okay, where is the drug? Where is the drug?' So you get these horrible dreams where you feel like you did the drug that you're trying so hard to stay away from," Weinapple said. Acupuncture calms those dreams down by stimulating the release of endorphins, hormones that Weinapple calls the body's "natural relaxants." "When you do drugs, the nervous system gets all out of whack," said Weinapple, a former cell biologist. Drugs interfere with the normal regulation of the nervous system, causing paranoia in some addicts, she said. "The acupuncture treatments actually help your body's physiology so that your own natural relaxants start coming into play again," Weinapple said. Coady said acupuncture plays a particular role in treating pain in a substance abuser. Sometimes people become drug abusers through prescription medications — other times they relapse because a doctor has treated them with addictive drugs. "Most people can take an opiate now and then," Coady said. "Most people can drink. I can't, and I don't trust myself with opiates, because if you're addicted to one thing, you're likely to be addicted to another." Options is just one of the recovery programs in Berkeley that offers acupuncture. Before the recent city funding cut, the Suitcase Clinic offered a variety of services including acupuncture on most Monday evenings at St. Mark's Church on Bancroft Way, near the UC Berkeley campus. Staffed by professionals and student volunteers, it was oriented to youth living on the street. Most of the Monday evening clients were foster kids "dumped out of the system" when they turned eighteen, said McDonnell. Many of these clients were abused and have run away from caretakers. This population is not easy to serve. They drop into the once-a-week clinic for dinner, acupuncture, massage, foot washing, and HIV tests, McDonnell said. The Suitcase Clinic is not a center for sustained treatment, but serves as a "gateway" to bring youth to other services that might get them off drugs and alcohol and into supportive housing. "They wouldn't walk into [the Lifelong Clinic] on their own," McDonnell said, but some do get funneled to LifeLong through the Suitcase Clinic. LifeLong is a medical clinic for people with limited income that is also funded, in part, by the City of Berkeley. Recent city budget cuts have eliminated the acupuncture program at the Suitcase Clinic and reduced LifeLong's program, housed at the Alta Bates/Summit Annex at Dwight Way and Milvia Street, from five days a week to three. McDonnell said she had hoped that the city would have directed a portion of a supplemental $36,000 grant for social services to the acupuncture clinics at the council's July 19 meeting. Another $50,000 in unallocated social service funds may be distributed in the fall, although numerous agencies will vie for the funds. "What's important about the LifeLong program is that it's open to everyone," Weinapple said, underscoring the need for a range of programs to match the needs of people addicted to drugs and alcohol. "There are so many people who aren't ready to enter a drug program immediately," she said. "We're kind of a stepping stone for them. They get to trust us." When clients come in for acupuncture treatments, they can opt to talk to a counselor. "Our counselor starts talking with them about what they need in their lives. We often funnel people toward Options. Sometimes we're the important first step for them just getting off the street. ... They set up their personal drug program with us, coming to acupuncture, going to meetings, getting counseling. Some people do it on their own. We're a hugely important step for that. Everybody's not ready to say, 'Now, I'm going into a drug program.'" Weinapple said that what motivates her is the dignity with which clients are treated at the Options, Suitcase, and LifeLong clinics. "Everybody is treated equally," she said. "People have a chance, when they come in here, to change their lives. And we've seen a lot of people change their lives. They will continue to come in and get treatments because recovery from drugs is a hard process. It's not, 'Oh, I've stopped using drugs and that's it.' It's a lifelong battle. When they come in here, it's helping them with this lifelong battle." With eyes set on college, many overlook the financial and educational benefits of apprenticeship. Boot camp coding schools promise big salaries after just a few months of training. But are they all they're cracked up to be? Progressive congregants at an iconic catholic church are unhappy with its new conservative leadership.